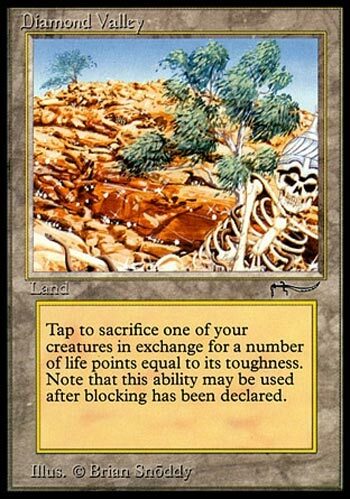 Diamond Valley is actually a pretty influential card, even if it itself sometimes fades a little into the background (mostly due to its being on the Reserved List). Temple of Aclazotz is the most recent, of course, but there was also Animal Boneyard and Miren, the Moaning Well. The designers have tended to be a little careful with the effect because of how easily it gets creatures out from under auras like Pacifism, how easy it is to get things back from the graveyard once they are there and out from under auras like Pacifism, and how strong some of the most popular death triggers are. I mean, you can gain 20 or more life when Kokusho dies at the best of times. The fact that the Diamond Valley itself doesn’t produce mana and has no activation cost for its ability prevents it from being strictly better or worse than the later iterations, but if you’re in 93/94 or some similar kind of format, the Valley is a fun card to build around. Didn’t we just review Temple of Aclazotz? I’m not crazy about lands that don’t produce mana, they are just mulligans waiting to happen. The life gain is nice but the main use of this card is to abuse death triggers and to fill your graveyard. Diamond Valley certainly is faster than Grim Backwoods though. Golgari has no shortage of sacrifice engines to choose from. Viscera Seer and Bone Splinters are preferable cheap alternatives. Diamond Valley was pretty revolutionary when it came out but it is janky by modern standards. The text on Diamond Valley, at least the Oracle version of it, looks pretty similar to Temple of Aclazotz, doesn’t it. Diamond Valley is one of the original lands that doesn’t tap for mana, but gives a powerful effect all the same; in this case, it serves as a sacrifice outlet in the vein of High Market, but with more life coming at the cost of not tapping for mana. Diamond Valley is a hard card to evaluate, as its power correlates very heavily to the quality of creatures you’d want to sacrifice; I believe it does have a home in a Legacy deck, some variant of Dredge? It’s by no means an essential part of the deck, but additional sacrifice outlets can be nice, especially if it gets you a benefit. Note that this is a hard to find and expensive card all the same, as a Reserved List card from Arabian Nights, so you may want to find an effective alternative that won’t shatter your wallet.